Studying with Srivatsa Ramaswami is transforming. He’s the real deal - clear, lucid, inspiring. He conveys the meaning inherent in pursuing the whole eight limbs of yoga. He shares his deep understanding with humility, strength and great, good nature." So wrote teacher and 30 year yoga student, Sherie Sheer, about her month long study with Srivatsa Ramaswami. Students felt connected to a lineage of a full spectrum of yoga: asana, chanting, philosophy, pranayama, service, study and meditation. Ramaswami studied under the tutelage of Krishnamacarya (1888-1989, considered one of the great yoga teachers of the 20th century) for 33 years and was Krishnamacarya’s longest standing student outside his own family. From the age of 15, Ramaswami arose at 4 A.M., bathed and went with his father to Krishnamacarya’s house at 5 A.M. to practice yoga before going to school and later to work as an engineer in his father’s business. Ramaswami studied with Krishnamacarya for 15 years before he began teaching yoga in a school of dance. It made me ponder how brief my own study of yoga was before I began to lead classes. Our classes met in University Hall, a large classroom and office building perched on the south bluffs of Los Angeles. For four weeks, a group of 30 yoga teachers and students from Canada, the Midwest, Texas and the West Coast met every morning from 9 A.M. to noon to practice Vinyasa Krama with this great and gentle man from Madras. Our teacher greeted us individually as we arrived before class. He began each session with chanting, explaining the meanings of the prayers as blessings for the teacher, the students and the teachings. We entered the sounds of Sanskrit. Om Saha Navavatu May we be protected. Saha Viryam Karavavahai May we study with energy. Tejasvi Navadhitamastu May we become filled with the luster of knowledge. Ma Vidvisavahai May there be no disharmony between us. Every morning, we began our practice with a standing sequence designed to open the chest cavity, shoulder girdle and arms. Ramaswami asked two members of the class to lead the sequence at the front of the room. By the end of the month, everyone had taken a turn. We stood in silence for a few moments in samasthiti (a state of balance). With heads bowed in jalandhara bhanda (chin lock), we raised our arms overhead to open our core body in twists, side, back and deep forward bends. We listened to the quiet voice of Ramaswami, breathe and speak through a microphone. "Inhale raise your arms overhead. Exhale —now lower your arms." It felt like we got on deck and set sail. A wind arose in the room as our breathing joined in the steady—whispered air of ujjayi (throat breathing). We sailed in prana sanchara—movement of the breath. The floor creaked as our feet spread into balance, facing a courtyard view of red gladioli, a water fountain and wavering feathers of pampas grass, luminous in the sunlight. The first week we encountered about 150 vinyasas (variations) stemming from tadasana (the hill pose) and asymmetrical seated postures. Our teacher described the essence of yoga as lying in the bandhas, muscular locks which massage the internal organs. He emphasized that the bandhas distinguish yoga from other forms of exercise. We practiced jalalandhara bandha by bringing our chin down towards our raised chest. This allowed my spine to lengthen, the back of my neck to feel open. We gathered our pelvic floor in mala bandha (rectal lock). We drew our abdomen up and back in uddiyana bandha (abdominal lock) in the pause after our outgoing breath. Using these bandhas in poses gave me internal anchors. Ramaswami asked us everyday in a cordial way, "Would you like to try this pose?" After each sequence, he invited us to "now please lie down and rest." This made me look at my language to students in my classes. How often I command, "Now let’s do this pose." Ramaswami believes the practice of yoga in America can be enriched, by offering the whole tradition. The key idea, he said, is enriching asana and he presented numerous lessons for doing that. During his month long residency, Ramaswami offered Vinyasa Krama on weekday mornings, a Saturday morning class in Samkhya Karika, the metaphysical principles that underpin yoga, and on Saturday afternoon, Chikitsa Krama, a workshop on the applications of yoga as a therapeutic tool. Vinyasa Krama yoga is a logically planned sequence of movements and poses with appropriate breathing, a method of linking breath to movement which Krishnamacarya used to teach asanas. Each movement is performed on a deliberate in or out breath. Ramaswami said Krishnamacharya insisted on synchronizing breath with movement. Vinyasa Krama means the art form of doing Yoga. Vi means variations possible, ni means permanently and aasa means to place correctly. We practiced flowing sequences originating from a standing tadasana position. We learned root poses and an array of variations along with the counter poses for each. Each week, Ramaswami introduced about 200 poses to the Vinyasa Krama class. With pages from his forthcoming book projected on the studio wall, students could observe a core pose and its progression of variations in sequence, as well as a large image showing the details of each pose. We climbed into difficult poses and watched adept classmates demonstrate advanced postures. Notebooks, laptops and cameras were allowed. Two students monitored video cameras on tripods at the back of the studio. During the third week, we practiced sequences of trikonasana, triangle standing Poses, vajrasana, seated postures, and a series of viparita asanas — inversions. Ramaswami recommended letting the legs hang limp in the air for the first few moments of the inversion, a subtle point of practice and how releasing it is to let the blood descend through the veins before reaching up with the feet. He impressed on the class the importance of practicing sarvangasana, shoulderstand, everyday for at least five minutes. Having taught yoga for twenty years in hospitals in India and more recently at the UCLA School of Medicine, Ramaswami conveyed the importance of not using yoga as an alternative therapy for acute conditions. "Yoga is for relatively healthy people," he cautioned. In every class, our teacher responded to numerous questions. Suheila Mouammar, mother of three sons, asked him to speak about food and eating. Standing in stocking feet with shoes removed, his hands gesturing to and from his heart, Ramaswami advised chewing a few leaves of basil first thing in the morning, grinding them together with neem leaf, turmeric and fenugreek. He recommended eating only to half one’s fullness: three handfuls of food at a meal, and having a light supper in the evening. His summary was jovial. "You know, we say a yogi eats one meal a day, a bhogi eats two meals a day, a rogi eats three meals a day." This teaching stays with me, putting three handfuls of food on my plate. We closed our daily practice sitting in shanmukhi mudra (closing of all six sense organs) for five minutes. With crossed legs and elbows at shoulder level, we pressed the pads of our fingers into points near our ears, eyebrows, nose and mouth. Sealing off the outer world, hearing the furnace sound of breath in our inner ear, stillness enveloped us. I felt full and balanced after each class and realized a new promise to always include time for pranayama and quiet sitting at the end of asana. At lunch every day, a small group shared a meal brought to campus by a nearby Indian restaurant. Amidst the burgers and fries going down in the cafeteria, we ate raita, pappadom, sag palak, dal, allogabi, pullao and salad, gently cooked vegetables and legumes in spicy sauce with yogurt, rice and bread. I tried to imitate our teacher’s small portions. We shared some leftovers giving the rest to a student who took them to homeless people at the beach. Members of the Vinyasa Krama class were affected by the month-long plunge into a daily three-hour practice of chanting, asana, breathing and meditation. Jessica Harper, a recent LMU graduate in dance said: "He offers completeness. After this month, I feel more balanced in my soul. This practice brings me closer to the kind of life I want to lead. It’s teaching me how to be a human being, humble, letting go." 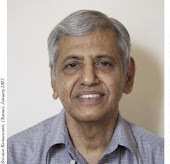 I was struck by Ramaswami’s steady energy at age 65, teaching for three hours every weekday morning, working with individual students in private sessions in the afternoon and offering lecture and discussion for a further five hours on Saturdays. Ramaswami showed us how to be more balanced as we live in an ancient tree of knowledge. I notice my spirit is steadier. There is more breath moving through my back. Daily life feels more like service and my energy is lighter after a month of morning practice with my kula, a group of yogi’s riding the waves of breath filled vinyasa. Ramaswami will return to LMU in November 2005 to continue teaching in the Yoga Philosophy Program. Visit http://extension.edu/yoga for information about courses and events. Charlotte Holtzermann teaches the Alexander Technique and Beginning Hatha Yoga at Loyola Marymount University. She writes on health and well being in Los Angeles.